We’re almost halfway through our Edinburgh Fringe preview season here at Laugh Out London towers, but there’s still pretty of comedy to catch across London. Celebrate Independence day with a double bill of Edinburgh fringe legends Richard Herring (“The Finest Comic of his Generation-GQ”) and Robin Ince (Neither of them are American but oh well). Sadly this one is sold out, Limited tickets may be available on the door. Our second gig at the lovely Lion in Stoke Newington welcomes “The King of Edinbrugh” (The List) Richard Herring for another preview, alongside Edinburgh Comedy Award Best Newcomer Nominee Liam Williams. Sold out, Limited tickets may be available on the door. 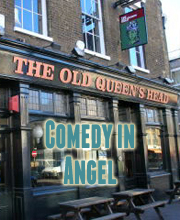 The Old Queens Head Islington welcomes Canadian Loon ™ Tony law and surreal wonder James Acaster. Sadly it’s all sold out. Limited tickets may be available on the door. No rest for the wicked. The delightful Shappi Khorsandi joins Edinburgh Comedy Awards winner Bridget Christie to preview their brand new shows for just £5. Very close to selling out. Limited tickets may be available on the door. Germany’s comedy ambassador and The Alternative Comedy Experience’s Henning Wehn partners The Unbelievable truth’s welsh wonder Lloyd Langford in Angel. Limited tickets may be available on the door. Josie Long & Tom Webb’s Megagames! Our final Edinburgh preview show ends with a bang. Triple Edinburgh Comedy award nominated Josie long brings her new show to Stokey with support from the truly unique experience which is Tom Webb’s Megagames! Anyone fancy a game of audience Guess Who?